When you share the road with commercial trucks, you are at risk of being involved in a truck accident. Tractor trailers are substantially heavier than passenger vehicles and light commercial trucks and because of this, collisions between them and smaller vehicles are far more likely to be fatal for the smaller vehicle’s occupants than the truck driver. There are two main ways to reduce your chance of being involved in a truck accident: taking the driving precautions you normally take, like obeying the speed limit and driving without distractions, and understanding the differences between large trucks and smaller vehicles so you can give them the stopping, following, and turning space they need. 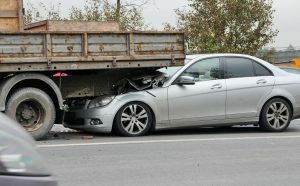 There are many differences between car and truck accidents. Some of these are the types of accidents that can involve trucks, like smaller cars becoming stuck beneath their trailers and collisions with jackknifing trucks. Others are the results of car accidents versus truck accidents. A tractor trailer can weigh up to 80,000 pounds, whereas the average passenger car weighs around 4,000 pounds. Because of this, the passenger vehicle’s occupants are in far greater danger during a collision. The first thing you should do is check to see if anybody involved in the accident needs emergency medical attention. If so, call 911. Otherwise, call the non-emergency police line to have an officer sent to the scene. Although you will likely file a PIP claim to recover compensation for your injury-related damages, you should gather evidence to support a personal injury claim anyway at the scene. This is because if you suffer a severe enough injury or experience excessive economic damages, you can seek compensation for them from the at-fault driver’s insurance provider. Evidence to gather includes photos of the injury and accident, contact information from witnesses to the accident, and a copy of the official police report. After leaving the scene, seek medical attention for your injury in a timely manner. Then, speak with a lawyer about your legal options. Although most truck accident victims seek compensation for their damages through their own insurance providers, it is still beneficial to work with an experienced truck accident lawyer who can guide you through interactions with your insurance provider and act as your advocate. To learn more about filing a PIP claim with a lawyer’s aid, contact our team at Nickola Law today to schedule your free consultation in our office.